Maykke YSA1073101 31" Brighton Sinktop with 4" Centerset Faucet Holes in WhiteDescriptionThe Maykke's dedication to find timeless, stylish and quality products can be seen throughout the Maykke's Brighton 31" ceramic sinktop with 4" centerset faucet holes in white. 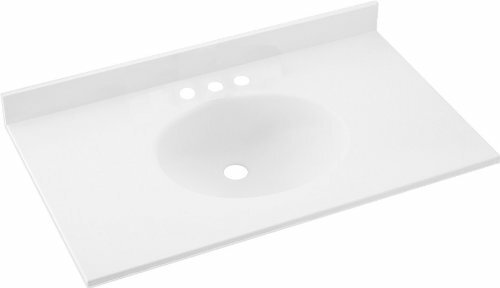 Industry standard sized sinktop with integrated rectangle bowl provides clean lines that work with both contemporary and transitional vanities.SpecificationsWeight: 35.27 lb(s)Overall Dimensions: 30-1/2" W x 22" D x 6-1/2" HSink Installation: Drop-InMaterial: CeramicColor: WhiteShape: RectangleDesign: TransitionalFaucet Centers: 4-inch CentersetNumber of Basins: 1Assembly Required: NoOverflow Hole: YesDrain Included: No but get it with Maykke drains YSA1260101 and YSA1260102Faucet Included: NoAbout MaykkeMaykke brings high quality and stylish home furnishings direct from our partner factories around the world to your home. It is our goal to make great products accessible and affordable to everyone. We work tirelessly to ensure that every product offered on our store has been manufactured to meet our high standards and yours. We save you time and hassle so you can relax while we do the heavy lifting for you. 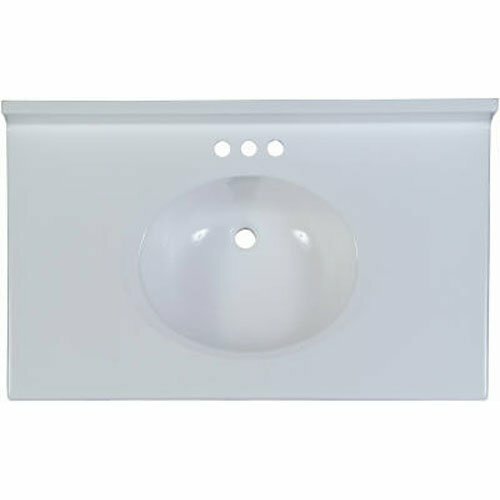 Maykke YSA1073103 31" Brighton Sinktop with Single Faucet Hole in WhiteDescriptionThe Maykke's dedication to find timeless, stylish and quality products can be seen throughout the Maykke's Brighton 31" ceramic sinktop with single faucet hole in white. 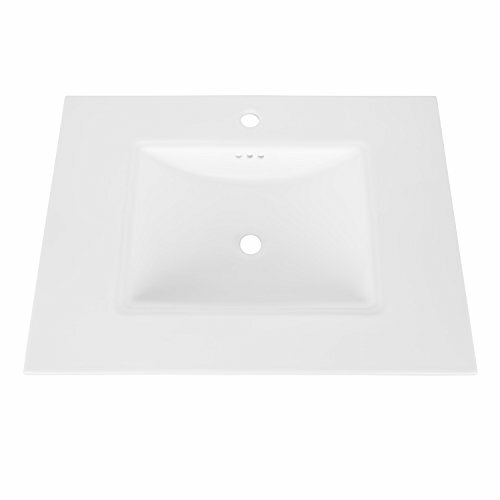 Industry standard sized sinktop with integrated rectangle bowl provides clean lines that work with both contemporary and transitional vanities.SpecificationsWeight: 35.27 lb(s)Overall Dimensions: 30-1/2" W x 22" D x 6-1/2" HSink Installation: Drop-InMaterial: CeramicColor: WhiteShape: RectangleDesign: TransitionalFaucet Centers: Single HoleNumber of Basins: 1Assembly Required: NoOverflow Hole: YesDrain Included: No but get it with Maykke drains YSA1260101 and YSA1260102Faucet Included: NoAbout MaykkeMaykke brings high quality and stylish home furnishings direct from our partner factories around the world to your home. It is our goal to make great products accessible and affordable to everyone. We work tirelessly to ensure that every product offered on our store has been manufactured to meet our high standards and yours. We save you time and hassle so you can relax while we do the heavy lifting for you. 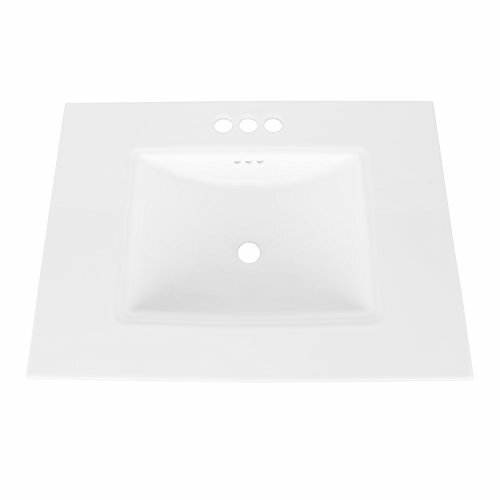 VT02243.010 Finish: White Features: -Solid surface.-Renewable surface will not wear away.-Coordinates with Swanstone bath and shower systems.-Easily accomodates all faucet styles. Options: -Available in several finishes. Dimensions: -Bowl size: 16 3/4'' W x 13 1/2'' D x 5 1/2'' H.-Top dimensions: 22'' D x 43'' W. Collection: -Everyday Essentials collection. Design House 557629 Camilla Vanity Top with 4"
The Design House 557629 Camilla vanity top with 4-Inch backsplash gives your bathroom a stylish, versatile look. This vanity top measures inches long by inches wide, and comes in a solid white that is sure to complement the rest of your bathroom décor. There are 3 pre-drilled holes, allowing for a 4-Inch center mount faucet. The drip-free edge is lifted to contain excess water, preventing messes. The backsplash helps prevent mold and water damage. 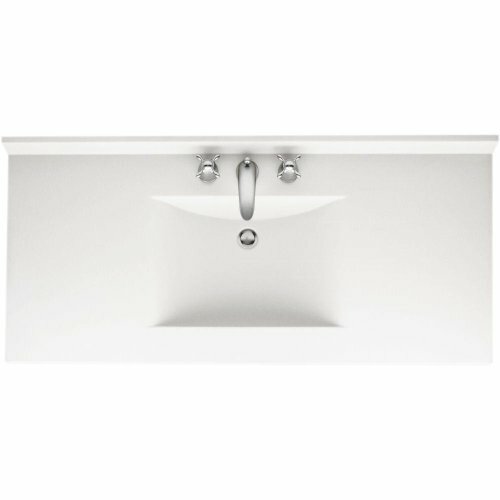 The Design House 557629 Camilla vanity top with 4-Inch backsplash comes with a 5-year limited warranty, so you can be confident in the quality of your vanity top. Design House offers products in multiple home decor categories including lighting, ceiling fans, hardware and Plumbing products. With years of hands-on experience, Design House understands every aspect of the home decor industry, and devotes itself to providing quality products across the home decor spectrum. Providing value to their customers, Design House uses industry leading merchandising solutions and innovative programs. Design House is committed to providing high quality products for your home improvement projects. 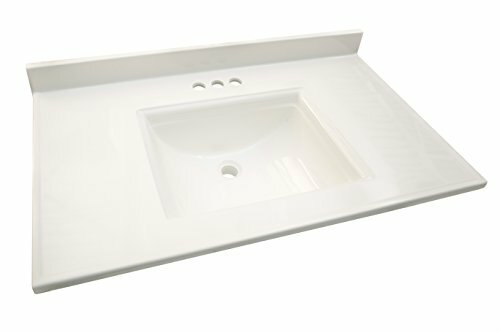 37 inch x 22", solid white, vanity top, with an oval bowl, with & 3 inch backsplash, bowl size: 16-1/2 inch x 13 inch x 6-1/4", fits 36 inch x 21 inch cabinet, high luster gloss gel coat finish, resistant to thermal cracking, Cigarette burns & bathroom chemicals, lifetime limited warranty, view pack carton. The product is manufactured in United States. Easy installation and easy handling. PREMIER BATHROOM VANITIES & CABINETS 2474647 Bathroom Vanity Top With Right Recessed Bowl, Cultured Marble, Solid White, 22X37"
Cultured marble standard vanity top with right recessed bowl predrilled for 4 inch centerset faucet 22 inch x 37 inch solid white. Design House 557637 Camilla Vanity Top with 4"
The Design House 557637 Camilla vanity top with 4-Inch backsplash gives your bathroom a stylish, versatile look. This vanity top measures inches long by inches wide, and comes in a solid white that is sure to complement the rest of your bathroom décor. There are 3 pre-drilled holes, allowing for a 4-Inch center mount faucet. The drip-free edge is lifted to contain excess water, preventing messes. The backsplash helps prevent mold and water damage. The Design House 557637 Camilla vanity top with 4-Inch backsplash comes with a 5-year limited warranty, so you can be confident in the quality of your vanity top. Design House offers products in multiple home decor categories including lighting, ceiling fans, hardware and Plumbing products. With years of hands-on experience, Design House understands every aspect of the home decor industry, and devotes itself to providing quality products across the home decor spectrum. Providing value to their customers, Design House uses industry leading merchandising solutions and innovative programs. Design House is committed to providing high quality products for your home improvement projects. Copyright © Wholesalion.com 2019 - The Best Prices On 22 White Vanity Top Online.